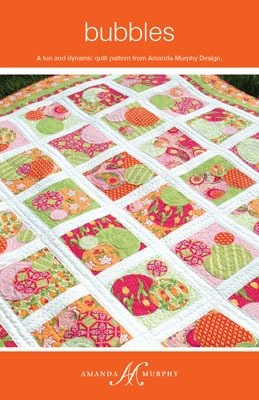 Amanda Murphy Design: Spring 2011 Quilt Market! What a delightful few days! 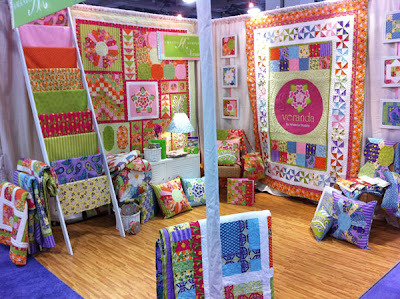 Quilt Market was wonderful and I was absolutely overwhelmed with the shear amount of creativity in one room. It is so nice to be around people who love what you love and who are enthusiastic about the sewing and fabric industry - and about helping people find the joy of creating things with their hands. It was amazing. I met so many people - I'm almost afraid to list them because I know I will leave out lots of fantastic ones, but I have to try... Julie of Jaybird Quilts, who has to be one of the most generous souls out there, Angela Walters of Quilting is My Therapy, who did some spectacular quilting on a logo quilt I designed (among many because her quilts were in virtually every booth), Allison of Cluck Cluck Sew, Sherri of A Quilting Life, John of Quilt Dad, Heather of a la Mode, Scott Hansen of Blue Nickel Studios, Lisa Lam (who recently wrote the best book EVER), Lizzy House, Tula Pink, Patrick Lose, Jennifer Paganelli, Kimberly and friends of Fat Quarter Shop, lots of magazine editors who I had never met face to face, and, of course, all the people at Robert Kaufman. Even Sarah and her mom, from JEllen's House of Fabric, stopped by. Oh, and I introduced myself to Anna Maria Horner and Camille Roskelley, both of whose blogs of love. The wall on the right is the logo quilt that I designed for this collection. Karen Fisher pieced it (thanks, Karen!) 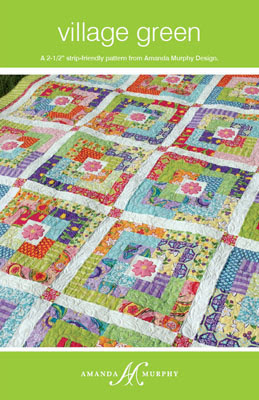 and Angela Walters did a fantastic job quilting it and I'll be able to show you more detail in later posts. The "Under the Veranda Sampler" on the left is a block-of-the-month shop program in six parts and was pieced by my daughter and me in 5 days! (Thank you, Cait - I'm forever grateful.) Deborah Norris of Deborah's Quilting in Gastonia, North Carolina, quilted it expertly (along with 6 other quilts in my booth). Each block also has directions for a coordinating accessory. So the idea is that if you don't want to make the quilt you can make a photo album cover instead of a bargello block, or a pillow instead of Dresden plate and flying geese blocks, etc. 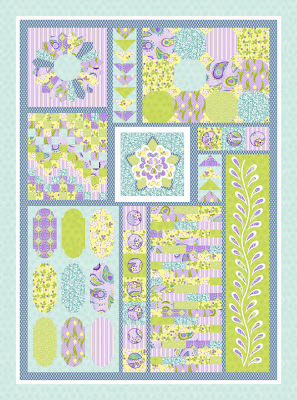 I used the pink and green color story in the quilt, but you can see a peek of the purple, aqua, and green color story in the accessories on the lower right. 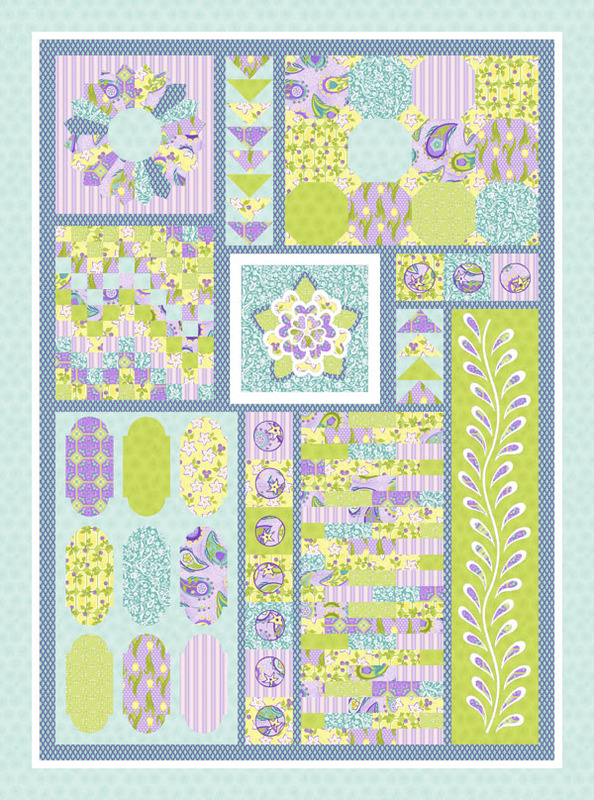 "Under the Veranda" is a program I designed exclusively for quilt shops that buy one or or both color stories of Veranda. They can then use these patterns to offer kits of classes. I'll be compiling a list of shops that are participating in this program on my website, so, if you are a shop that is interested, make sure to contact me. 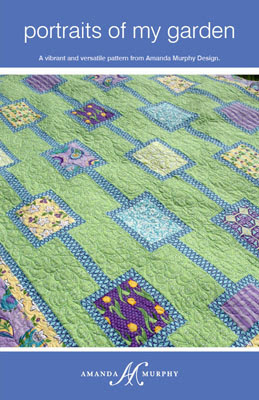 All these quilts were quilted by Deborah Norris. So, that is what I have been working on. 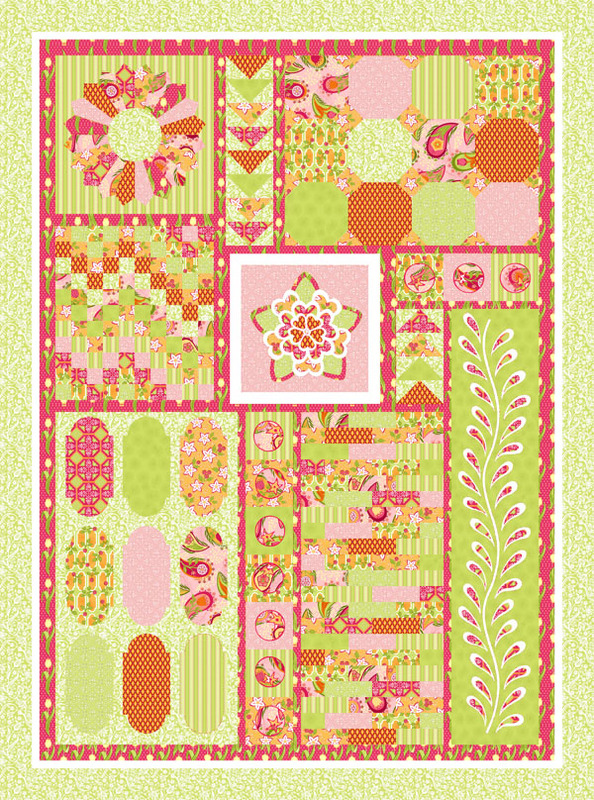 (If you are still listening to me babble on, I am looking for one more pattern tester for Village Green. If you are interested, email me. 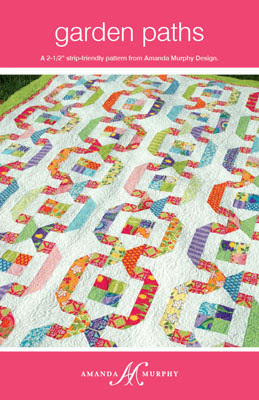 This is a scrappy quilt made out of 2 roll-ups/jelly-rolls. You must be in the U.S. or Canada so that I can get it to you quickly. I'll need it tested in the next couple of weeks. Some fabric scraps might be in your future. First come, first served.) Sorry - the pattern tester spot has been taken - thanks! There were some flight delays on the way home, but nothing like what experienced on the way out there, but - get this - I ate dinner at the airport with Becky Goldsmith. Yes, I am talking about the Becky Goldsmith of Piece 'O Cake Designs. And she gave me a book about needle-turn applique, which I have always wanted to learn. Yes, I received a book about applique from Becky Goldsmith. 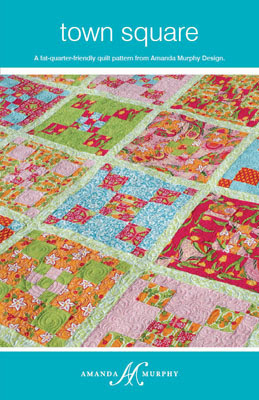 If you are reading this blog you are obviously a hard-core quilter and will know how big a deal that is. Becky confirmed my view that quilters everywhere are just the nicest people. And then, to top it all off, my seatmate on the way to Chicago was Anja Pundt, who owns Nahwelt Machemer, the biggest quilt shop in Europe, and had just bought my line that morning, and she was lovely. It is a small world. A good market all around. I'll be back in future days to give you more details about Veranda, Under the Veranda, and patterns. In the meantime, happy sewing! What a great feast for our eyes! Your booth is wonderful - it's great to finally get a good look at veranda. All those patterns are just lovely, especially "blossoms" and "bubbles" I love the look of them. 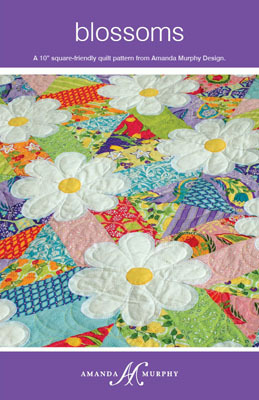 Sounds like you had great time meeting all those other quilting greats too! What a horrible way to start out! I'm glad that you got there safely and managed to jump in....feet first! Good trooper! Wonderful patterns! I love the Blossoms one. :) (But they are all great). I'm sure they will all be big sellers! Congrats. it was great to meet you, if only briefly in a crowd...don't be a stranger.. wink!